For several decades, California has served as the epicenter of the American food scene. California produces one-third of the nation’s food, is home to one in eight American consumers, and boasts a staggering 90,000 restaurants. California is also where eating trends are born, and where fast food, organic food, and Napa Valley wines became durable icons of American culinary culture. The state’s place atop the national food chain, though, is in jeopardy. In recent years, California legislators have pursued regulations that negatively impact many important agricultural and culinary trends. State and local governments have banned or severely regulated a veritable smorgasbord of foods, including everything from eggs to French fries to bacon-wrapped hot dogs. 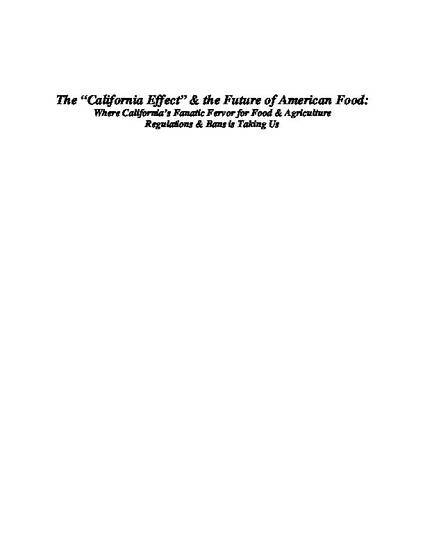 California’s turn against food impacts the rest of the country, too, since in addition to its place as the nation’s breadbasket and culinary trendsetter, the “California effect” has meant that the state is America’s cultural and regulatory bellwether. This article looks at these worrying legal trends and explores the bright past, gloomy present, and cloudy future of food in California and across America. This document is an early version of the article and is not the published version.